What a difference a year and a coach can make. Last year, Jeju United was the second worst squad in the K-League, but after head coach Park Kyung Hoon took charge on Oct. 30 last year, United has risen to the top of the K-League table. In his own words, the team “had really low self esteem and low confidence” when he arrived. After finishing no better than 10th in the past four years, it came as no surprise that the Jeju squad was lacking confidence. To remedy this, Park said that it was necessary to first “build trust between the coach and players.” Watching the team practice, it was clear that Park has established that relationship and that he takes a very personal approach with his players. He was constantly active, running about, giving tips and shouting encouragement to all his players. It was rare to see him standing still and barking orders. Using his active and personal approach, Park has looked to develop “a sense of color as Jeju United,” creating a new personality in the locker room, and on the pitch. of the team, notably Captain Kim Eun Jung at striker, who came from Changsha Ginde of the Chinese Super League, midfielder Park Hyeon Beom and striker Bae Ki Jong from Suwon Samsung Blue Wings, and goalkeeper Kim Ho Jun and striker Lee Sang Hyup from FC Seoul. Although United has gained prominence only recently, Park is no stranger to the spotlight. 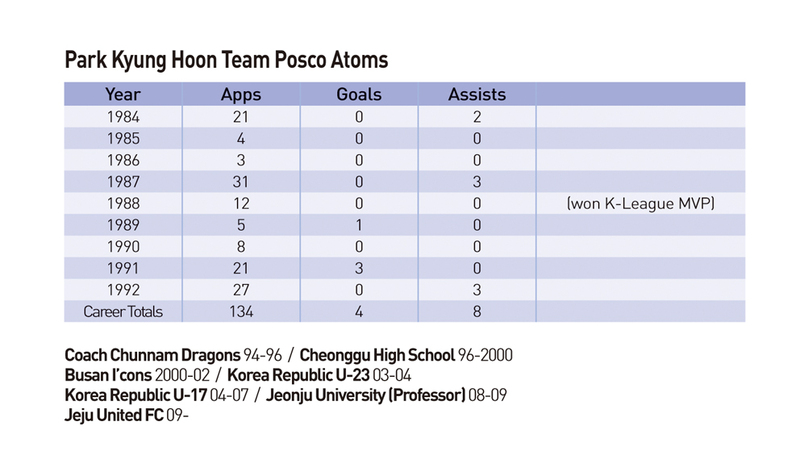 He spent 9 years in the K-League, all with the POSCO Atoms. He also accumulated 88 caps for the Korean Republic senior team, playing in two World Cups, ’86 in Mexico and ’90 in Italy. He said that “one of the most special experiences I had was defending Maradona” in ‘86, Korea Republic’s first appearance in the World Cup finals in 32 years. He was also the manager of Korea Republic’s U-17 men’s national team from 2004-2007, getting the opportunity to manage during the U-17 World Cup in Korea. 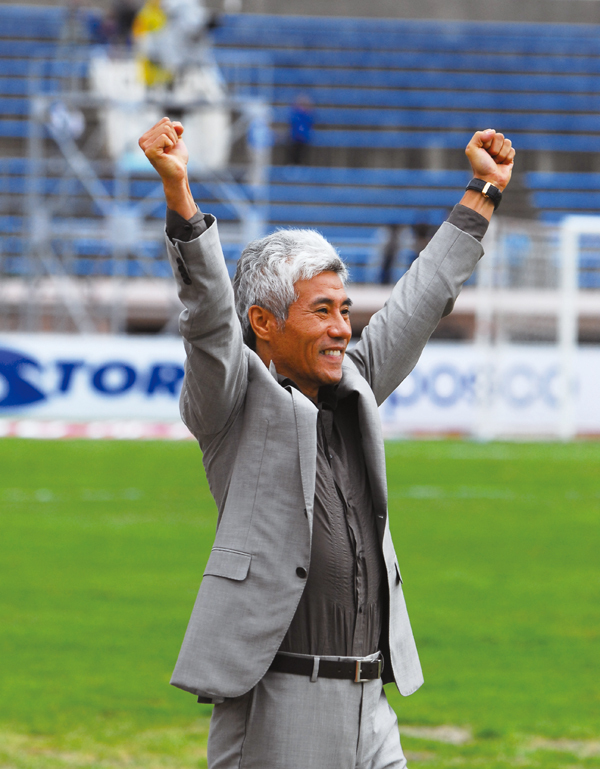 He also has spent time on the coaching staff of the Chunnam Dragons, Busan I’cons, and the Korea Republic U-23 squad. Although the K-League is not well known outside Asia, Park stated that “the K-League’s game has improved a lot in the past” and “is in a transition phase.” Even with the rise in the level of play in the K-League, attendance numbers are dismal compared to other major leagues around the world. Only two teams average over 15,000 fans a game, Suwon Samsung with 25,736 and Seoul FC with 30,069, respectively, as of the 29th round of the season. Park thinks that some of “the [K-League’s] problems originate from the coaches themselves. Coaches need to be coaching games more excitably and enjoyably.” If you have watched Jeju play this year, you know that Park takes this to heart. They have already scored 54 goals this year, with one game remaining. Last year, Jeju scored 31 goals total. Considering the remarkable turnaround that Park has engineered here on Jeju, it would be wise for the KFA to take a closer look at Jeju’s manager. He has quietly taken a perennial K-League bottom feeder straight to the top and might be just the man to do the same for the Korean national team in years to come. But right now, it seems that Park is comfortable right where he is on Jeju. He has a beautiful training ground, at least one decent home pitch, and a successful team to boot.